While recording and identifying World War One soldiers for the Barnsley War Memorials Project we often come across stories that may not be from our own family history, but are so interesting or plain odd that we feel they should be shared. 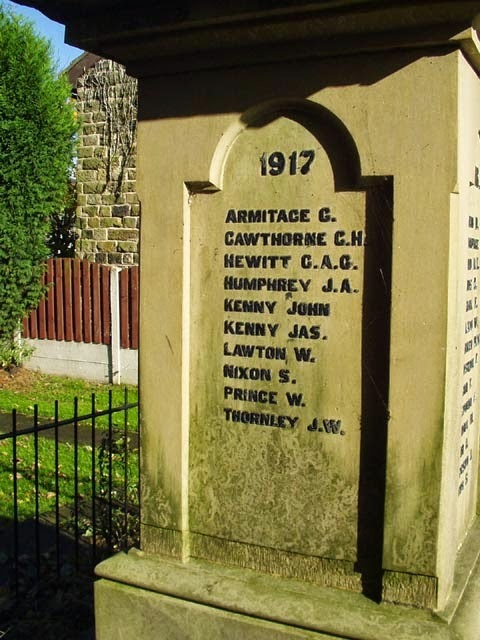 Both myself and our Information Officer PS are intrigued by James and John Kenny of Worsbrough (sometimes Worsborough or Worsbro') Common, cousins who joined the Barnsley Pals together and were sadly killed on the same day as each other. On the war memorial at St Luke's, Worsbro' Common the names are sorted by year. 1914 and 1915 fit on one panel with the dedication and then 1916, 1917 and 1918 have a panel each. In total there are 46 names on the memorial, I have identified all but two men, and even for one of those I have an educated guess about who he is. I have been adding their stories to the Lives of the First World War (LFWW) community for Worsborough Common, which will eventually (hopefully) include all the men and women from the area who served, or were affected by the war. On the 1917 panel there are two men with the same surname, and unusually on the memorial, in order to differentiate them they have their forenames indicated. John and Jas (though James would only have been another two letters!) Kenny were cousins and had lived near each other all their lives. Their service numbers are even sequential (although that might be to do with the fact they have the same surname) and both their service records survived the blitz, although they are very damaged. Both men were unmarried and working as miners when they enlisted in the 14th York and Lancaster Regiment (the 2nd Barnsley Pals) on 9 March 1915. James (b.Q1 1881) from 31 Peel Street, Worsbro' Common was 34 years old, although he claimed to be 33 and 64 days, knocking one year off his age. He was assigned the service number 14/832. John (b.Q2 1874) from the White Bear Inn, Worsbro' Common was nearly 41 years old but claimed to be 37 years and 323 days old, removing a more substantial three years from his age. His service number was 14/833. I find these numbers very easy to remember and that is quite handy as I now have so many men 'remembered' on LFWW, which has no alphabetical sort mechanism, that it is simpler to just enter a number to get to a man I am updating. You can see how close to each other the men lived in the map snip above. Peel Street is just below the word 'Stone' of High Stone Road, the main road running diagonally across the image. The White Bear Inn is the square block on the end of a row of back to backs directly across the road from the end of Peel Street. It was still there a few years ago (link to Google maps) and was one of the few remaining old buildings in the area. Like most of the other men in the 2nd Barnsley Pals they were posted overseas at the end of 1915 and spent a few months in Egypt. They arrived in France in March 1916 and appear to have survived the infamous first day of the Battle of the Somme unscathed. There are no wound reports in either of their service records. The only mention of any medical treatment I can find is that John apparently had his boils looked at 'In the Field' in April 1916. Neither man appears to have committed any recordable offence, which considering their history in Barnsley in their youth is quite remarkable. In searching the British Newspaper Archive which I can access via Find My Past I found a couple of mentions of the Kenny family. One typical entry is from the Sheffield Evening Telegraph in 1903 headlined 'Barnsley Gambling Raids'. James Kenny (our man would have been 22 years old at the time), Thomas Kenny, George Kenny and a number of others, some of whom may have been related to the Kenny family by marriage, were implicated in a gambling school at Worsborough Common. The police gave evidence that, 'the defendants, with some 30 or 40 others, were engaged gambling in Moss Square on the afternoon of Sunday, the 22nd ult." (Sheffield Evening Telegraph 2 April 1903) Moss Square is adjacent to the White Bear Inn. Most of the men were found guilty and fined 10s and costs. 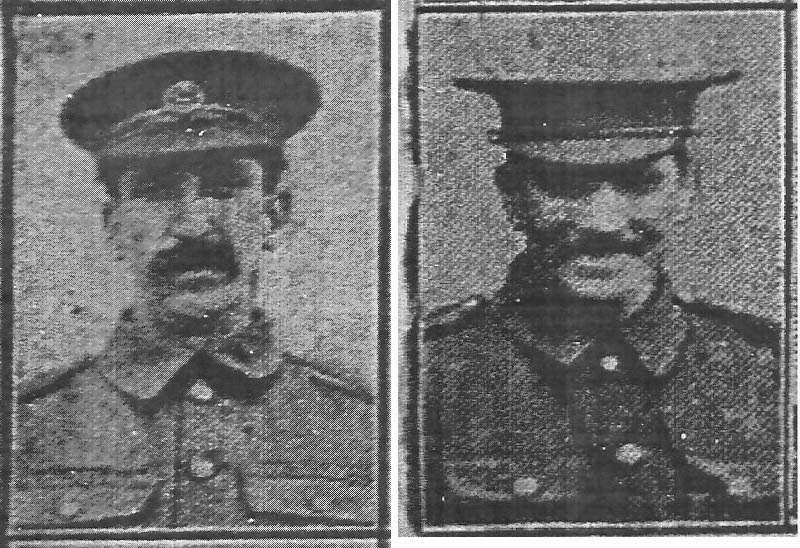 I found pictures of both men in the Barnsley Chronicle after their deaths in France on 8 May 1917 were reported. Unfortunately both images were labelled Pte J Kenny (Worsbro' Common, killed) so I don't know which is which. Maybe we could take a guess at the one on the left being the older man, but I wouldn't like to say for certain. I have researched the Kenny family going back to the mutual grandfather of the two men and forward to people who may well still be alive today. John Kenny was born around 1809 in Louth, Ireland (according to the 1851 census) which is a county on the east coast in the present Republic. We can only assume he married Elizabeth (maiden name unknown) who was from Wombwell, in Yorkshire at some point before or around the birth of their first child, another James, in 1840. 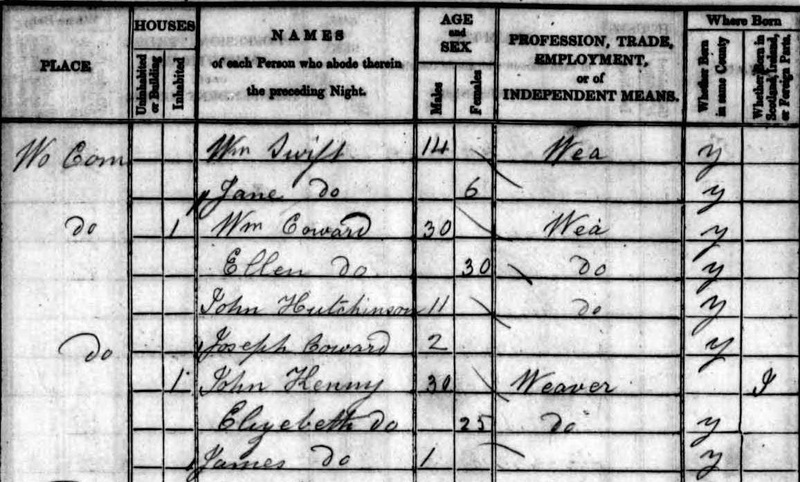 In the 1841 census they are living in Worbro' Common and John is a weaver. He indicates his origin in Ireland with an I in the final column of his record. John and Elizabeth have at least seven children, I have found five who marry and two spinster sisters, Hannah and Mary who keep a shop in Worsbro' Common up to their deaths in the 1920s. I have found 32 grandchildren! Surprisingly only the two men who feature in this story appear to have joined up to serve in the war - although Kenny is a fairly common name and there are other Kennys from Barnsley who serve who are (probably) not related. A female cousin of the men, Annie Kenny, is widowed in 1919 and remarries shortly afterwards, but there is nothing to suggest that her husband William Hinchliffe died of anything related to the war. Both John and James Kenny are remembered on the Arras Memorial in France. This suggests that they had no known grave. However some personal items are listed in their service records as returned to the next of kin of each man; James a letter and some photos, John a letter, postcards, photos and two religious books. This may be because they left these items behind somewhere safer when they went into the action in which they were killed. Both men had given their religion as Roman Catholic on their enlistment papers, which is probably why I can't find their baptisms or their grandparents marriage on Ancestry. Their service records also each contain a completed 'Next of Kin' form which lists their parents, even though James parents were both deceased by this time and so was John's mother, and their siblings. This is very useful as it confirms their sisters' married names. Both are unfortunately very faint as if written in pencil and then maybe water damaged. 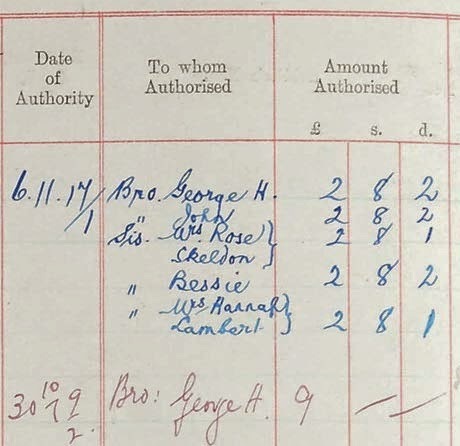 In the records of Soldiers' Effects which were recently released on Ancestry there is even a list of all of James' siblings as his balance of pay was divided equally between them all in November 1917, presumably due to both his parents being dead. You can just make out sisters Mrs Rose Sheldon and Mrs Hannah Lambert who each got on penny less than brothers George and John and sister Bessie whose married name, Winfield, is not given. Later on, I think in 1919, eldest brother George receives a separate £9. This appears to be the War Gratuity paid by the War Office which may equate to the total time served by the man. According to the Battalion War Diaries recently released on Ancestry (what would I do without it!) 14th York and Lancaster Regiment had been 'In the Line' at Gavrelle and Windmill, part of the Battle of Arras, since 2 May 1917. They were heavily shelled from the 4 May onwards with numerous casualties. On 8 May the enemy barrage ceased at 7am and during the night they were attacked by four or five waves of Germans. The trenches were very muddy and there was rain and mist. Our side called down an answering artillery barrage and "the double barrage made the area like an inferno". On 9 May the writer of the diary reports that they were relieved by 12th York and Lancs (the Sheffield Pals) and he lists a total of 2 Officers and 29 other ranks killed, 2 officers and 109 other ranks wounded, 2 men missing and 2 wounded who remained on duty, adding up to 145 men out of action. They had however captured a German machine gun and 43 enemy rifles! The brevity of the Kenny men's obituary and the 'inferno' described by the officer together with the lack of known graves paints a sad picture. Were they defending their trench from the Germans side by side and both killed? - but surely if this was the case their bodies would have been returned and buried. What is more likely is that the two cousins were hit by a shell and completely lost amid the mud and rain. There was nothing left to bury. John Kenny is remembered on his family's gravestone in plot E 547 of Barnsley Cemetery. 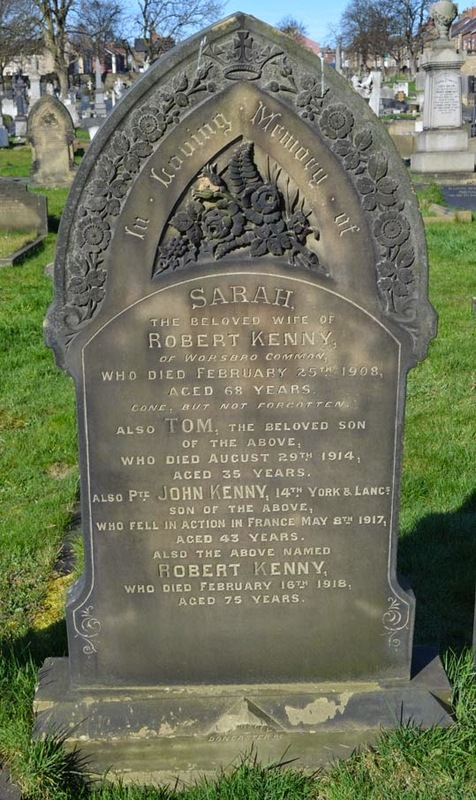 In Loving Memory of / Sarah / the beloved wife of / Robert Kenny / of Worsboro Common / who died February 25th 1908 / aged 68 years / Gone, but not forgotten / Also Tom, the beloved son / of the above / who died August 29th 1914 / aged 35 years / Also Pte John Kenny, 14th York & Lancs / son of the above / who fell in action in France May 8th 1917 / aged 43 years / Also the above named / Robert Kenny / who died February 16th 1918 / aged 75 years. This is the branch of the family who ran the White Bear Inn, maybe they had a little bit extra money for a nice gravestone. Note that this stone says that John was 43 years old, the newspaper report only said he was 42. There is no evidence of a stone remembering cousin James.